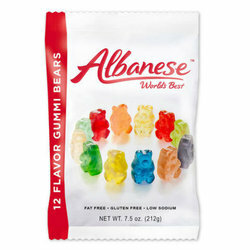 Albanese Gummi Bears. All your favorite flavors in one place! Enjoy the World's Best Gummi Bears in 12 fresh fruity flavors. Something sweet that is Gluten and Fat Free. Each 7.5 oz bag has about 5 servings per bag. Each 7.5 oz bag has about 5 servings per bag.